I'm seriously slacking on the food blog these days. I just looked back at my posts from last November and I posted EVERY. SINGLE. DAY. the week before Thanksgiving. I was a food blogger possesed. This year...not so much. I can only use my playoff "hangover" excuse so long, so I will blame it on the fact that I am not hosting Thanksgiving this year. Also, I tend to gravitate towards the "old standby" side dishes at Thanksgiving dinner, and I already shared most of those with my readers last year. So this post will be two-fold. I'm happy to report I'm making my triumphant return to the cooking portion of my blog with this lovely delicata squash recipe. 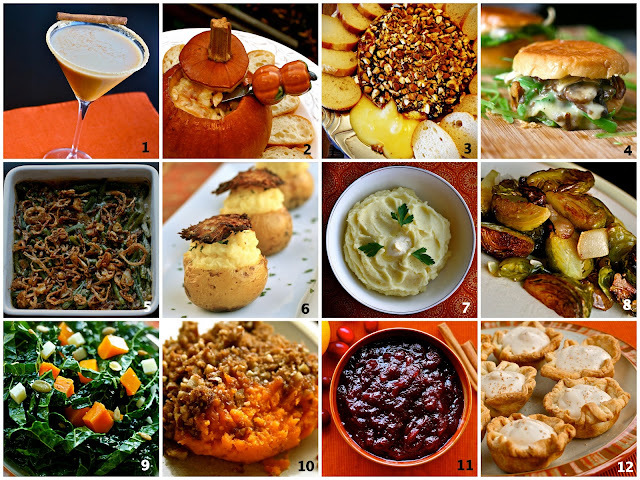 I'll also be sharing my top-12 Thanksgiving recipes if you are still looking for some delicious appetizers or sides for next week. Let's start there. Whether you're looking for classic comfort foods or new takes on old favorites, I've got you covered (in no particular order). 1.) Pumpkintinis: the perfect pre-Thanksgiving apertif. 2.) Pumpkin Fondue: it's fondue! Baked in a pumpkin! 3.) Baked Brie: hands down, my go-to appetizer, any time of year. 4.) Green Bean Casserole Grilled Cheese Sliders: a fun take on a Thanksgiving classic (and bronze winner in the Wisconsin Grilled Cheese Recipe Contest). 5.) Green Bean Casserole with Homemade Ingredients: speaking of green bean casserole...try this healthier take without all the icky canned ingredients. 6.) Triple Threat Potatoes: Another twist on a holiday favorite includes mashed, baked *and* fried taters. 7.) Garlic Mashed Potatoes: the best mashed potatoes you'll ever eat. Period. 8.) Roasted Brussels Sprouts with Bacon & Pears: I heart brussels sprouts. And bacon. That is all. 9.) Kale Salad with Roasted Butternut Squash: a delicious and healthy addition to your Thanksgiving table. 10.) Grand Marnier Sweet Potatoes: spike your sweet potatoes with Grand Marnier and candied pecans. It's almost like dessert! 11.) Grand Marnier Cranberry Sauce: So simple, yet so good. As a bonus, it can be made a few days ahead of time. 12.) Caramel Apple Pie Pudding Shots: While we're on the subject of spiking sweets...how about ditching the pie for these mini guys...spiked with Caramel Bailey's and apple rum. (Careful, they can be habit-forming). But if you're looking for something new...I highly recommend this tasty and simple side dish using delicata squash. Delicata might be my new favorite squash. As the name would suggest, I love the delicate yet rich flavor...but more than anything, I love how easy they are to cook. If you've tried to hack through a butternut or spaghetti squash, you know what I'm talking about. Delicata squash has a very thin skin that doesn't require peeling and slicing them up is a breeze. (Girly alert: I also love how they sort of resemble little flowers once they are sliced). You might remember last fall, I made my friend Kasey's Delicata Squash Pasta. For that recipe, I cut the squash lengthwise and then into little half "moons." That's definitely the easiest way to clean this squash, but I wanted to make rings for a prettier presentation on the platter, so I sliced it first and then used a melon baller to clean out the seeds. Sticking with the "ring" theme, I did the same with the pears...slicing and then coring with the melon baller. I sliced about 1/4 of a red onion into thin slivers. Gently toss sliced squash, pears, onions and garlic with olive oil. Sprinkle with your favorite fall seasoning blend and spread in a single layer on prepared baking sheet. I used a delicious maple garlic seasoning from my trip to The Spice House in Chicago. It's called "Gateway to the North," and it's a blend of pure maple sugar, brown sugar, Kosher salt, Tellicherry pepper, garlic, onion and green onion flakes. In other words, it's a magical blend of YUMMMM. Seriously. It's ridiculously good on fall vegetables, and you should probably order some online. While squash is roasting, lightly toast the pine nuts in a heavy bottom pan on the stove. My pan had some olive oil residue from some chard I had made earlier, so I just left it. But feel free to toast yours without chard oil. Cook 12-15 minutes, or until tender. (You can also place the pan under broiler for a couple minutes if you want to achieve a nice brown color). Using tongs, gently place vegetables on a platter, taking care not to break the squash or pears. Sprinkle with toasted pine nuts and goat cheese. Pre-heat oven to 400 degrees. Line a large, rimmed baking sheet with aluminum foil. Gently toss sliced squash, pears, onions and garlic with olive oil. Sprinkle with seasoning blend and spread in a single layer on prepared baking sheet. Cook 12-15 minutes, or until tender. (Optional: place under broiler for a couple minutes if you want to achieve a nice brown color). Using tongs, gently place vegetables on a platter, taking care not to break the squash or pears. Sprinkle with toasted pine nuts and goat cheese. It's ridiculously good on fall vegetables, and you should probably. Thanks for the ideas! I am going to try the squash recipe, it looks perfect. I might try the apple pie shots with a little phyllo dough cup or something, to use "less crust" which is always an issue for me. Awesome! And you could always make the shots without crust and serve them in shot glasses like I did for the eggnog pudding shots. Happy Thanksgiving.